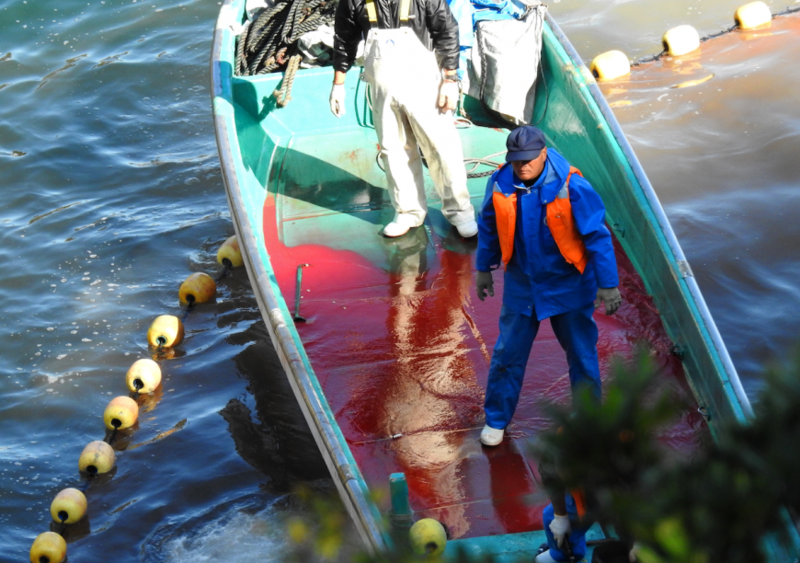 Taiji, Japan: January 27th turned out to be yet another torturous day for the dolphins in Taiji, Japan. 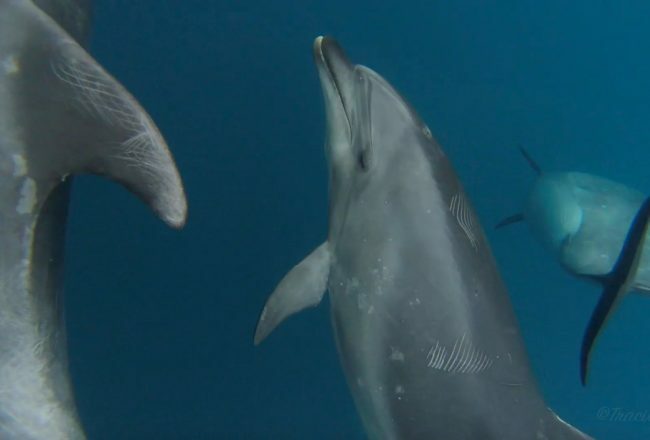 In less than two hours after the fleet of banger boats left the harbor, the dolphin hunters located a pod of striped dolphins and chased them down. 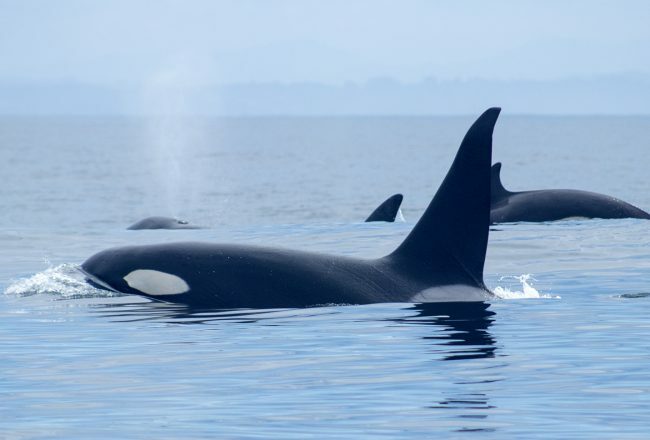 The pod was no doubt exhausted after a prolonged chase, but just as the hunters started to push them into the Cove, the pod turned around and made a last-ditch effort to escape. They managed to break free and swim away from the hunting fleet, but they had lost much of their strength, and it was easy for the hunters to catch up with them. In every hunt, the hunters’ constant banging on metal poles creates a wall of sound underwater. It disorients and scares the dolphins so the hunters can force entire pods to swim straight into the Cove. As soon as that happens, the hunters cut off the dolphins’ escape with nets. 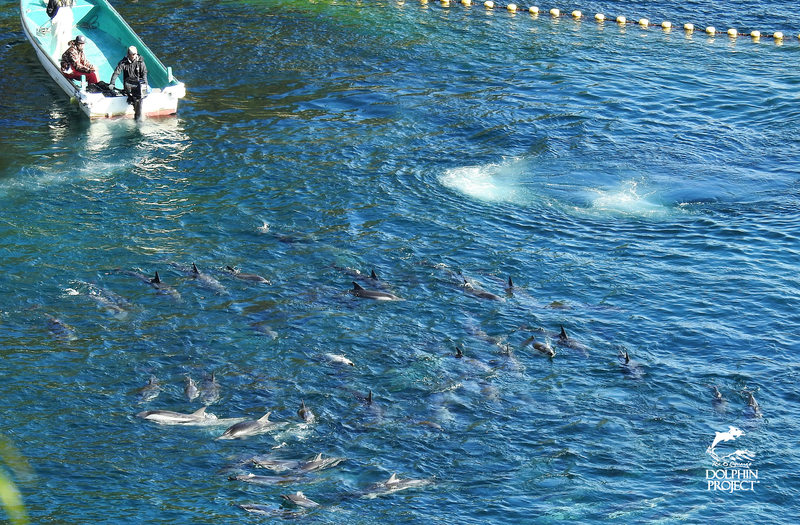 Minutes later, the dolphins swim in a tight circle in the Cove. As usual, this year we saw juveniles among them swimming close to their mothers’ sides, not knowing that this will be their last moments together. Striped dolphins are a social dolphin species and often travel in tight, cohesive groups that sometimes consist of hundreds of individuals. They are not often found in captivity, as they are not as easily trained as some other dolphin species. Taiji Whale Museum, of course, keeps striped dolphins in small tanks and sea cages. 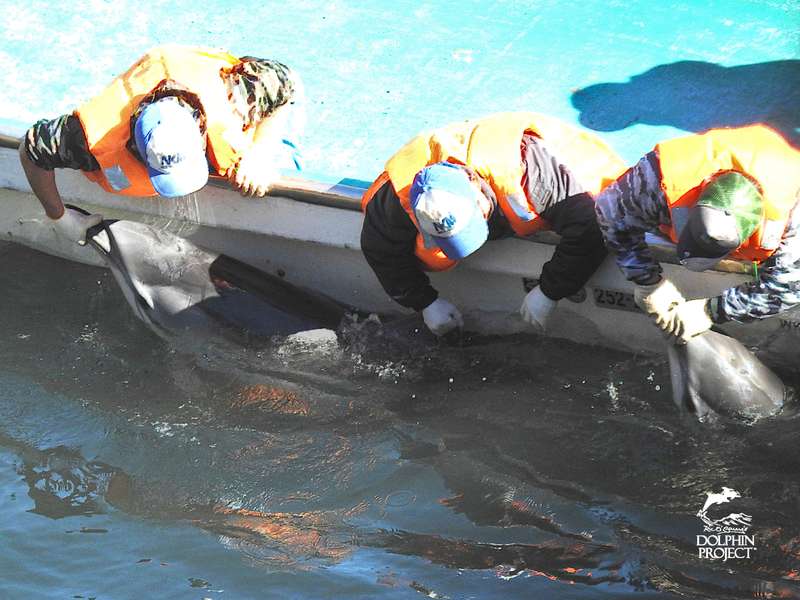 So far, five striped dolphins have been taken for captivity during this hunting season. This time, however, the dolphin trainers did not show up. They were no doubt aware that a large pod of dolphins was trapped in the Cove but apparently had no interest in selecting any of them. The blood bath that followed dragged on for hours. 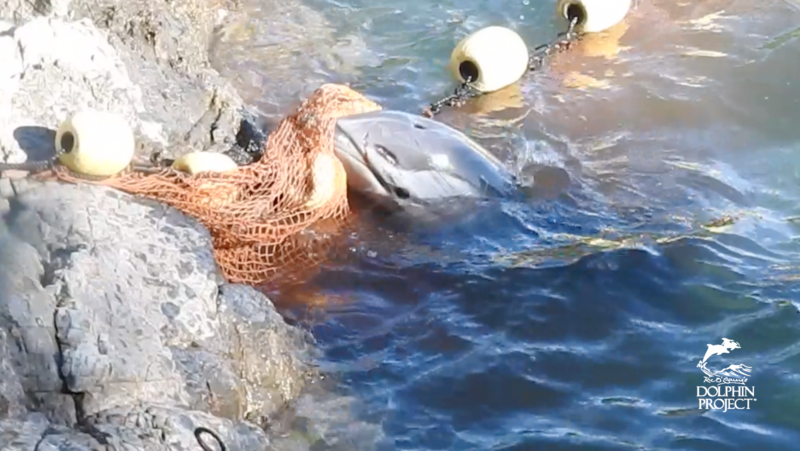 Some dolphins made a desperate attempt to escape but got entangled in the nets. 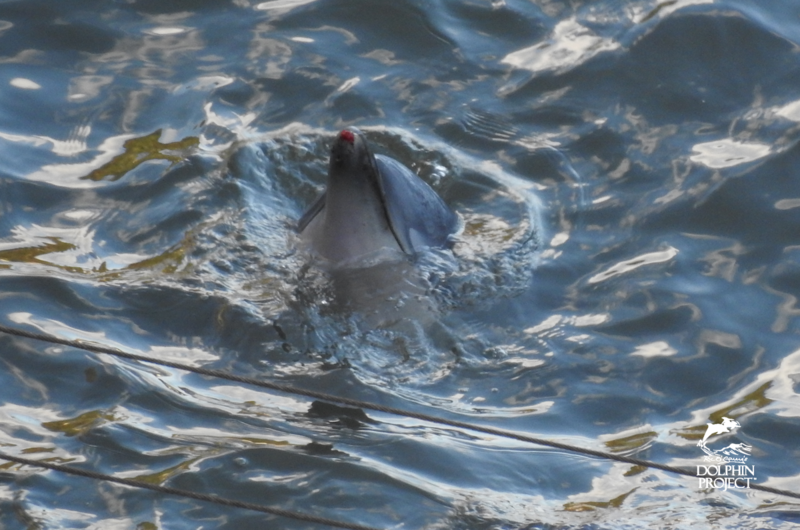 Other dolphins were bleeding from wounds, like a dolphin that was spy hopping, blood visible on its rostrum. The injured dolphins could have easily been hit by the outboard motors of the skiffs that the hunters use to force them toward the killing beach. In previous slaughters, we have seen the hunters drive the skiffs right over the dolphins when forcing them into the shallows. As always, they erected tarps over the killing beach to prevent us from filming the slaughter. Not only is this slaughter tremendously cruel, it is also cowardly and unjust. The dolphins have little chance of escape during the chase out at sea: they run out of strength long before the boats run out of fuel. Their lives are at stake, but they cannot swim fast enough to avoid capture. How many calves fall behind and get lost out at sea during a chase, we will never know. There was frantic splashing in the water near the tarps as dolphins attempted to get away. Others were forced to watch their pod members get dragged underneath the tarps. 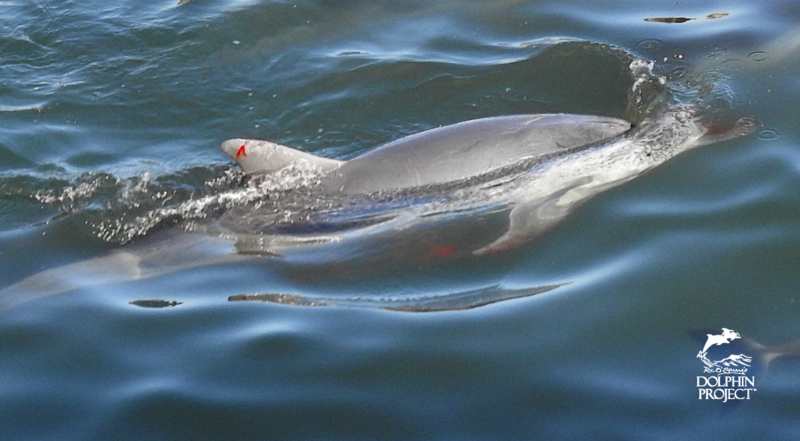 One young dolphin left behind a long trail of blood along its body as it tried to stay afloat. Three hunters working from a skiff grabbed the rostrums of two dolphins that were huddled together in the Cove. One dolphin broke free. The other didn’t. A hunter took a strong hold of that dolphin´s beak and kept the dolphin’s mouth completely shut. Another hunter leaned over and seized the dolphin’s pectoral fin, and then they turned the dolphin upside down and pushed it beneath the surface of the water. It is a scene of such savage violence. In no way can Taiji’s dolphin slaughter be called a “tradition.” It cannot even be called a hunt. It is cold-hearted torture, pure and simple. The hunters have told us in the past that, to them, the systematic slaughter of entire pods of dolphins is a form of pest control—the dolphins eat the fish that the hunters want for themselves. By getting rid of the dolphins, they eliminate the competition. This time, the slaughter, which seemed to go on for an eternity, appeared to be a show of force for the hunters. It was as if they were amused by the dolphins’ powerless predicament and futile attempts to escape. Despite the tarps, the hunters were unable to conceal the carnage. Soon, the Cove turned red with blood. 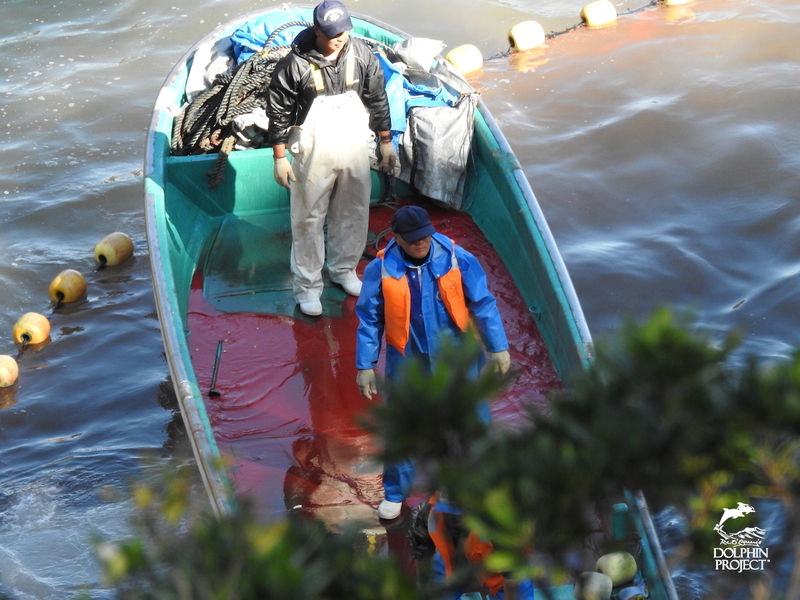 The dolphins that were still alive appeared to be completely paralyzed with fear as they floated around in the blood of their dismembered and dying family members. The scene was one of tremendous cruelty and chaos, but as the slaughter progressed, we could hear loud yelling—even laughter—from underneath the tarps. We couldn’t see it, but we knew that the hunters tied the dolphins down by their tail flukes as they killed them one by one. Imagine what the dolphins go through as they hear and see their pod members being dragged underneath the tarps and killed. We could hear the heartrending sound of the dolphins thrashing about underneath us. The cruelty is mindboggling, yet it continues year after year. The hunters have claimed that this is their tradition and something that they are proud of, yet they spend much of their time hiding the slaughter from the rest of the world. Occasionally we heard the sickening sound of the hunters throwing dead bodies onto the skiffs. Then they took the lifeless bodies to the butcher house. Right past their still-living pod members. There is always an eerie silence in the Cove when it is all over. No more sounds of thrashing. 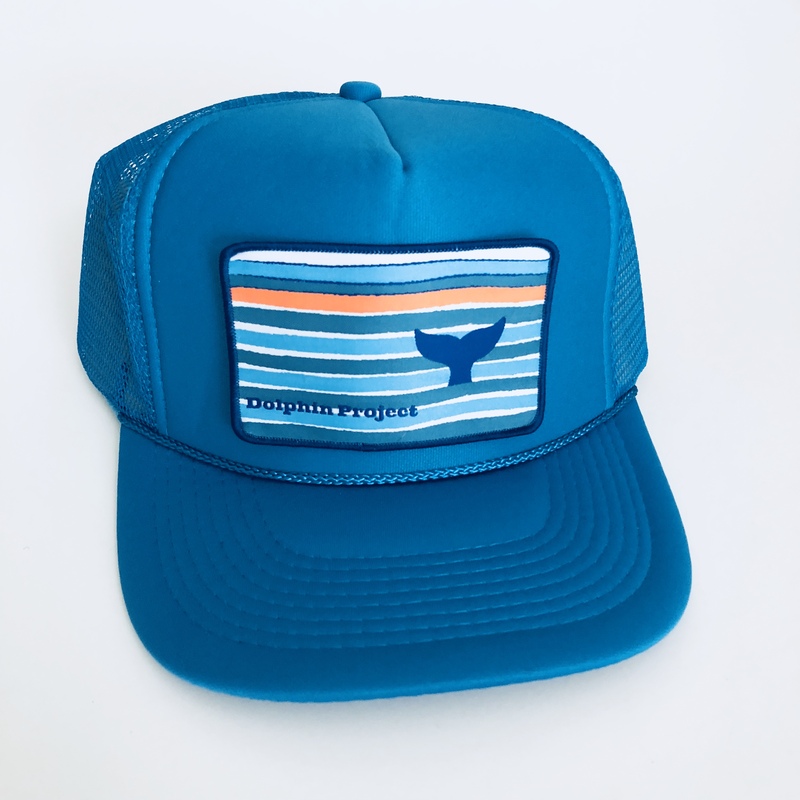 An entire pod of striped dolphins gone. We will never forget how hard they fight to get away, or how desperately they struggle as they are tormented underneath the tarps. 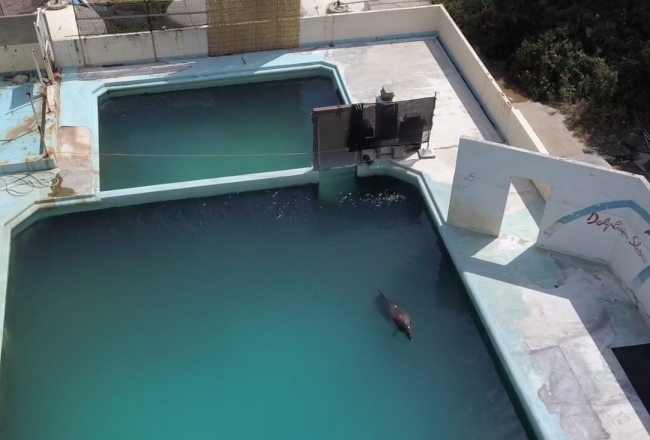 Prior to their deaths, these dolphins are inflicted with unimaginable trauma. The hunters killed every single dolphin in this pod. None were selected for captivity, but it is important to realize that the international captive dolphin industry fuels the dolphin slaughter in Taiji. The demand for show-quality dolphins that can be sold at a high price to dolphinariums makes it tremendously profitable. Countless dolphins captured during Taiji’s wildly cruel dolphin drive hunts have been sent to dolphinariums around the world. There are dolphinariums that do not engage in the trade of wild-caught dolphins. Instead, they rely on captive breeding. 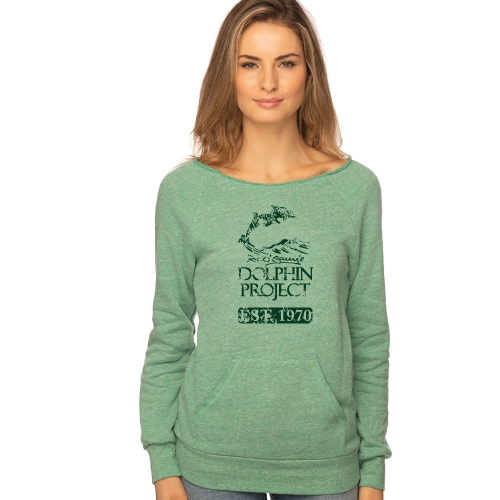 They pride themselves in not purchasing dolphins from Taiji. These dolphinariums, if they wanted to, could stop the slaughter simply by sending representatives to the Cove to speak out against it. But they don’t. They never do. And that is what needs to change to stop this madness: Dolphinariums that do not purchase dolphins from Taiji need to break their silence. They cannot keep hiding the way they do. By remaining silent and doing nothing, they are responsible for the continued slaughter of dolphins in the Cove.